Make half the plate fruits and vegetables. Serve plenty of brightly colored fruits and vegetables at meals and snacks. Choose whole fruits (fresh, frozen, canned or dried) more often than juice — whole fruits have more nutrients and less sugar. Offer water instead of juice when your child is thirsty. Make fruits and vegetables fun — help your kids make kebobs, salads and smoothies. Microwave a small baked potato. Top with reduced-fat cheese and salsa. Make at least half the grains you serve whole grains. Children should have a quarter of their plate filled with grains. Choose whole grains and cereals at least half the time. Check the ingredient list on food packages to determine if a food is a whole grain — the higher up “whole” grain appears on the list, the more whole grains the food contains. Sprinkle grated cheese over a corn tortilla; fold in half and microwave for 20 seconds. Top with salsa. Toss dried cranberries in instant oatmeal. 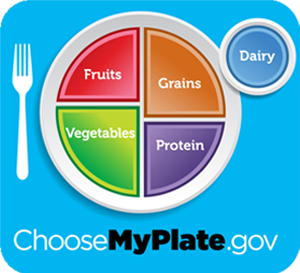 Children should have a quarter of their plate filled with a lean protein — protein foods include meat, poultry, seafood, eggs, beans, peas, soy products, nuts and seeds. Bake, broil or grill protein foods instead of frying — don’t forget that many products are “pre-fried” before you buy them even if you bake them at home (chicken nuggets, fish sticks, tater tots, french fries, etc.). Dip baked tortilla chips in bean dip. Add one serving of low-fat dairy products to your child’s plate — serve fat-free or 1% milk, which have the same amount of calcium and other essential nutrients as whole milk, but less fat and calories. Foods made from milk that have little to no calcium, like cream cheese, cream and butter, are NOT part of the dairy group. Banana Split: Top a banana with low-fat vanilla or strawberry frozen yogurt. Sprinkle with your favorite whole-grain cereal. Make snack kebobs. Put cubes of low-fat cheese and grapes on pretzel sticks.